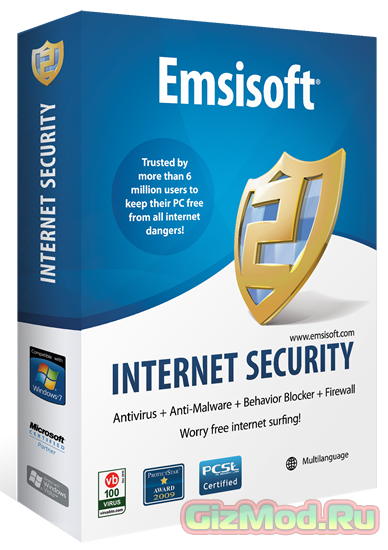 Emsisoft Internet Security 9.0.0.4668 - Этот пакет защиты премиум версии дает отличную альтернативу другим классическим пакетам Security Suite. Антивирус, Антишпион и Файрволл - все в одном, но каждый продукт является мировым в своей категории. Категории и теги: Программы » Антивирусы » Скачать, Emsisoft Internet Security, Антивирус, Защитник, Сеть, Вирусы, Банкинг, Сканер. • Fixed an occasional Eurekalog crash. • Fixed a memory corruption issue. • Fixed ‘cannot connect to service’ issue. • Fixed a disappeared icon in the notification area. • Fixed some issues with scheduled scans. • Fixed a permissions/password related issue. • Fixed an occasional issue where actions were being denied by the behavior blocker although they were explicitly allowed. • Fixed a memory corruption issue in a2cmd. • Fixed an issue in Windows Safe mode. • Improved signatures download speed during installation. • Improved surfprotection notifications and handling. • Improved Surfprotection for windows XP. • Improved icon ‘last update’ information. • Improved WSC integration on vista. • Improved a2cmd /L parameter parsing and related folder creation. • Improved a2cmd /wl and /q parameter parsing.